Easter or Pascha is the time of the year to celebrate the resurrection of Jesus Christ. Easter Day 2018 is coming soon and we expect this year’s Easter will be filled with a lot of egg-tivities as usual. We have handpicked a few exciting Easter menus for you and all you need to do is decide which to go! Are you ready to celebrate this special time of the year? Check out these restaurants with delectable dishes and fun egg-tivities! Babe is offering a special brunch this Easter Day! A brand new pool deck style brunch is waiting for you at Babe! From 12pm – 3pm on Easter Sunday, be there to savour an incredible line-up of Babe’s best canapés while relaxing to the chill tunes being played by Babe‘s DJ. If you feel like splurging, top up for another RM250++ to enjoy free flow of Perrier-Jouët Champagne (original price is RM700/bottle! ), wine and soft drinks. And wait! Another great news: all TABLEAPP ELITE Members will receive 10% off the food bill in this special Easter Sunday Champagne Brunch! Limited spots. Reservation is required. 11th Floor, Work @ Clearwater, Jalan Changkat Semantan, Damansara Heights, 50490 Kuala Lumpur. 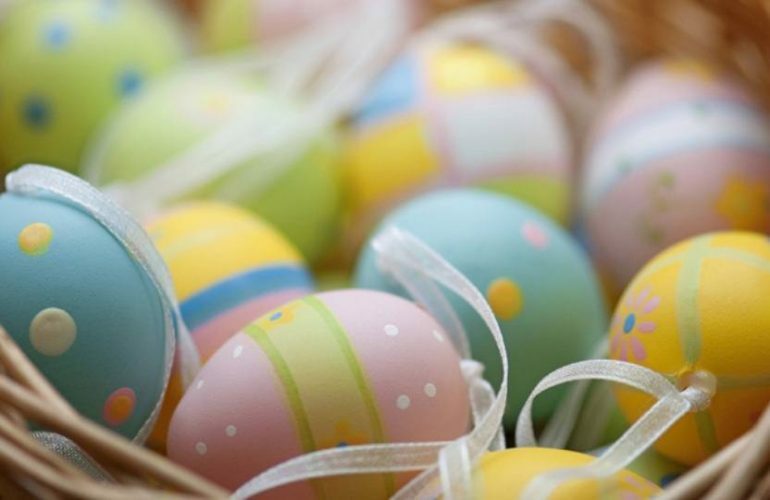 Sentidos Gastrobar is offering a special Brunch Buffet for this Easter Day. 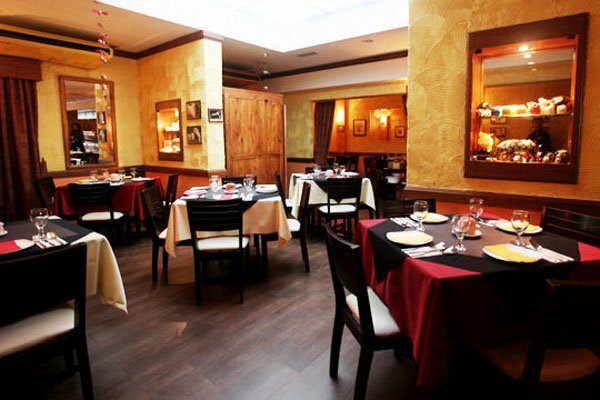 Sentidos Gastrobar has always been delighting its diners with their unique Latin cuisine at a hip and vibrant atmosphere. 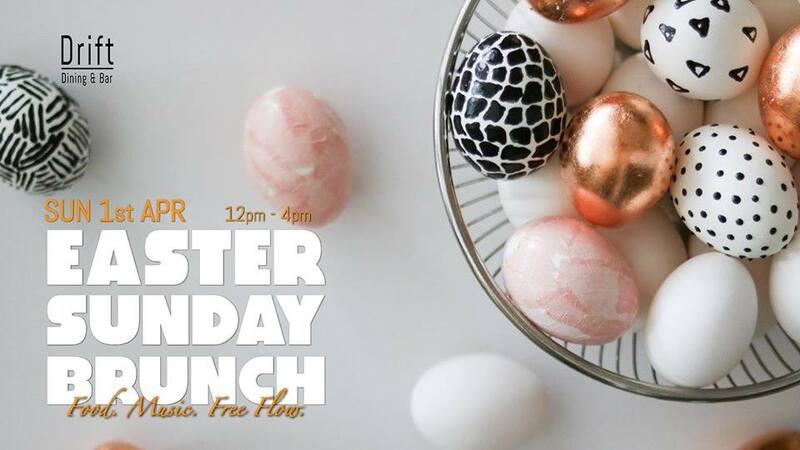 This trendy-looking restaurant will be offering Easter Fiesta Brunch Buffet on this Easter Sunday featuring cold cuts, tapas, fajitas and other exciting goodies. Also, we are dropping a TABLEAPP-only exclusive discount: enjoy a 20% off for Easter Fiesta Brunch Buffet if you make a reservation via TABLEAPP. How can you resist this? Feast Village, Starhill Gallery at JW Marriott Kuala Lumpur, 181, Jalan Bukit Bintang, 55100 Kuala Lumpur. 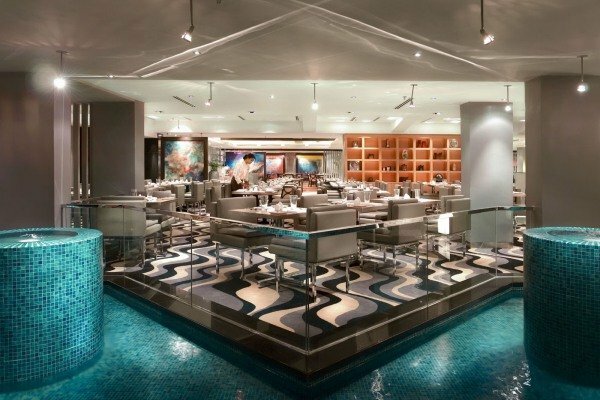 Come to this modern open-concept restaurant to please all of the senses with exquisite cuisine while being serenaded by a stunning live music performance this Easter Day! Fun activities are waiting for you to egg-plore such as egg hunt and egg painting! Children below 6 can dine for free! 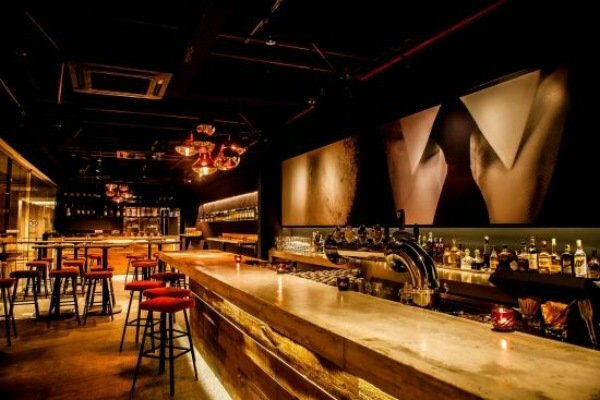 Drift Dining and Bar will hold an Easter Sunday Brunch with music and free flow of drinks. 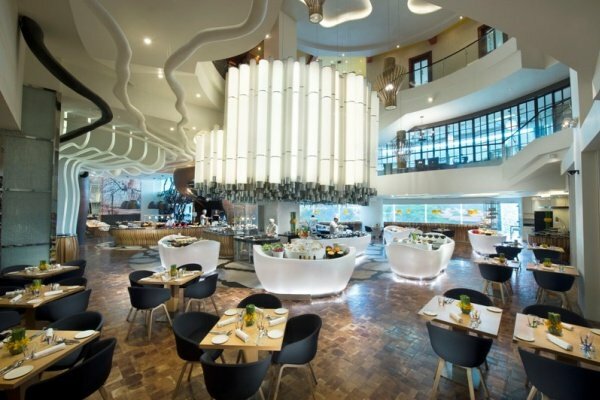 Drop by Drift Dining and Bar to enjoy free flow of drinks and listen to live music while savoring the food here. The restaurant has even prepared a bouncy castle outside on the veranda for the kids which means a great day out! On the menu we spot pretty good indulgences like Fine D Clair Oyster, Tiger Prawn, Smoked Salmon Benedict, Chicken Tortilla, Roasted Lamb, Easter Cheese Cake (gasp!) and more. At the time of writing, Drift is almost fully booked. So hurry up to book! 38 Bidara, Jalan Bedara, Off Jalan Nagasari, Bukit Bintang, 50200 Kuala Lumpur. Be ready for a bubblylicious brunch at El Cerdo! The Easter bunnies are waiting for you at El Cerdo with lots of egg-citing activities. Of course, porkylicious food will be served because this is what El Cerdo is famed for. The all-you-can-eat pork menu includes roast baby back ribs, seafood spaghetti, pork belly fettucini and pork steak. On this special day, kids will get to meet the clown, have some egg guessing game, and oh, everyone will get a chocolate egg too! 43 & 45, Changkat Bukit Bintang, 50200 Kuala Lumpur. Gobo Chit Chat is preparing for a great Easter Sunday Brunch. 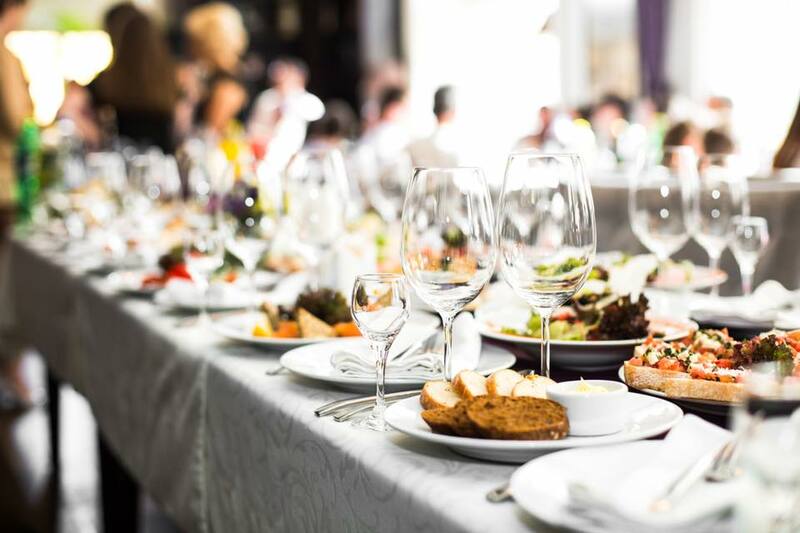 As one of the best international buffet restaurants in Kuala Lumpur, Gobo Chit Chat at Traders Hotel Kuala Lumpur is a favourite dining spot for locals and tourists. On April 1st, Easter Bunnies are hopping around Gobo Chit Chat and we have spotted good news from the restaurant! You can dine for FREE if you go in a group of 5 people! Level 5, Traders Hotel Kuala Lumpur, Kuala Lumpur City Centre, 50088 Kuala Lumpur. Full-of-surprise activities are waiting for you at Soleil. If you are looking for fun activities with your little loved ones, Soleil is a must-go restaurant! Keep your little ones excited with a number of full-of-surprise activities such as Easter egg hunt, coloring contest and a lot more while enjoying unlimited orders from starters, main courses to desserts including duck confit, Belgian mussel pot, roasted lamb leg, oven baked salmon, mini strawberry pavlova, Easter cupcake, and more. RM80++ per child aged 6 – 12 years old. Lot 13A & 15, 2nd Floor, Damansara City Mall, Damansara City, 6 Jalan Damanlela, 50490 Damansara Heights, Kuala Lumpur. 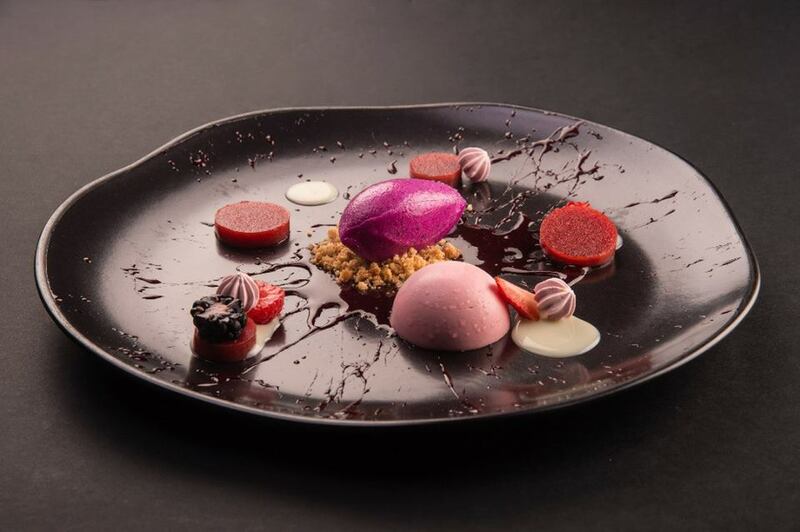 If you are in search of a unique friendly atmosphere to savour the freshest homemade dishes for this Easter Day then Neroteca at Bukit Ceylon would be the perfect dining spot for you! There are a variety of hearty and tantalizing mains such as Homemade Fettuccine With Speck and Radicchio or the delightfully sumptuous signature dish Classic Porchetta which you won’t want to miss! RM220 for alcohol free flow. Unit G-1, Seri Bukit Ceylon, No.8, Lorong Ceylon, 50250 Kuala Lumpur. Savour the best Spanish and Italian food at Sapore. Head to Sapore if you want to truly indulge yourself in great Spanish and Italian food during this special time. Walk through a variety of delights from cold cut platter to pasta, Iberico pork shoulder and sumptuous desserts such as Easter chocolates. 18, Persiaran Ampang, Desa Pahlawan, Ampang, 55000 Kuala Lumpur. Dimsum for Easter Sunday Brunch at Toh Yuen? Why not? An Easter Dim Sum Brunch, you ask for? 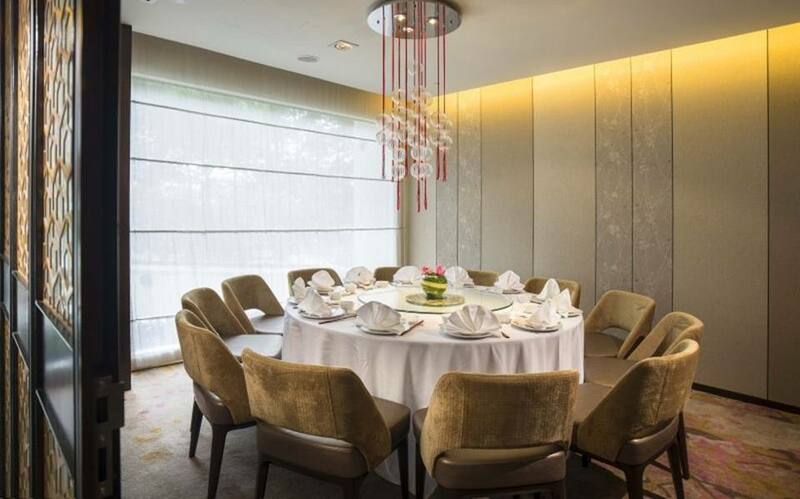 Buckle up and head to Toh Yuen at Hilton Petaling Jaya! Easter here comes with a delightful twist with Dim Sum Chef Yat’s Special Handmade Bunny Mochi with 4 flavours to choose from! Dive into freshly made ala-carte buffet style dim sum including your all-time favourite Creamy Salted Egg Yolk Custard Bun and Har Gao. Remember to take a bag of Easter egg candies and traditional Chinese bunny biscuits too before heading home! RM48 nett per child aged 6 – 12 years old. Level 1, Hilton Petaling Jaya, 2, Jalan Barat, PJS 52, 46200 Petaling Jaya, Selangor. 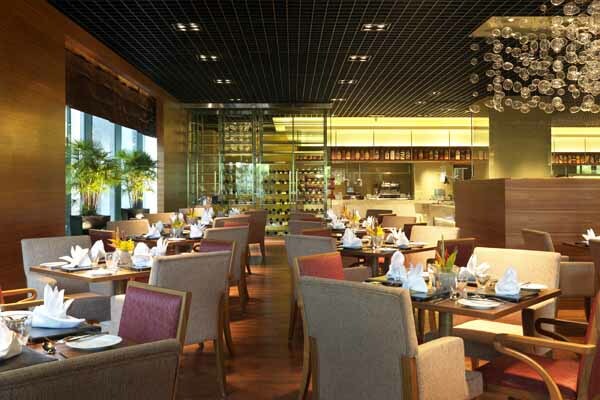 Savour the finest food and enjoy stunning view at Makan Kitchen and Tosca at DoubleTree by Hilton Johor Bahru. 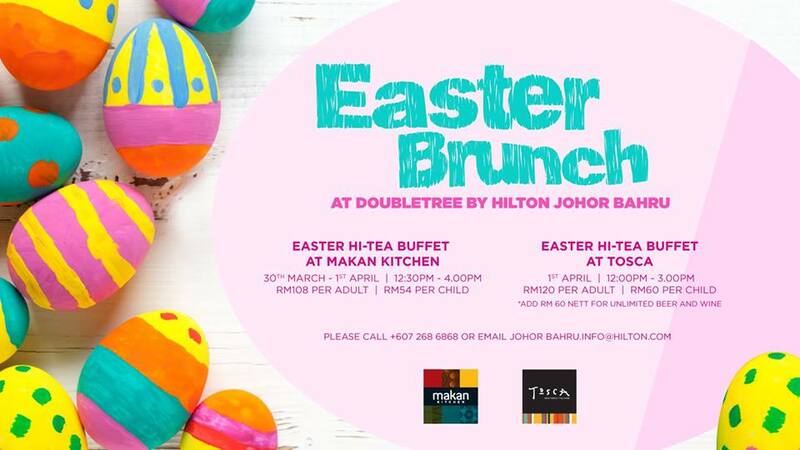 If you are staying at Johor Bahru, join DoubleTree by Hilton Johor Bahru at Makan Kitchen and Tosca Italian Restaurant for a fun-filled Easter weekend! Makan Kitchen is an eclectic all-day dining restaurant which serves famous local specialities and is a must-visit restaurant if you want to experience some of Malaysia’s finest cuisine in Johor Bahru. RM54 nett per child aged 6 – 12 years old. Tosca Italian Restaurant will surprise you with their rustic Italian food prepared with contemporary flair for this time of the year. 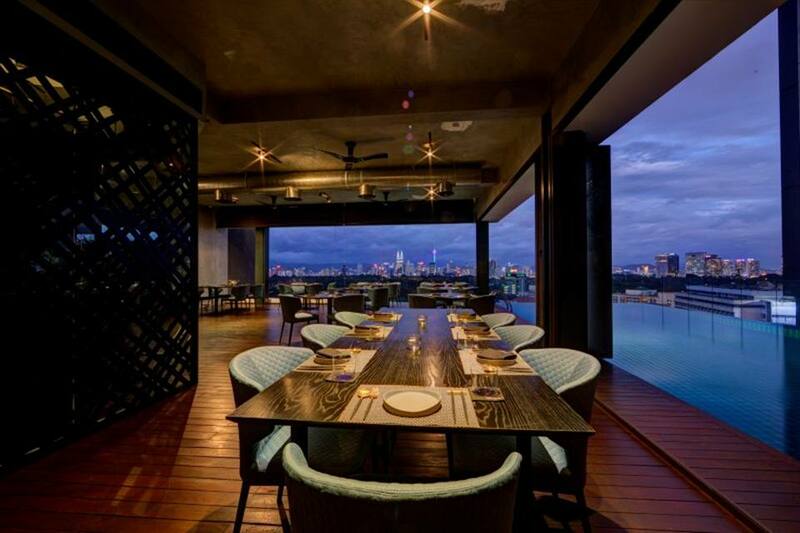 Treat yourself and your loved ones to stunning views over the Straits of Johor and delicious dishes here. RM 60 nett per child aged 6 – 12 years old. DoubleTree by Hilton Johor Bahru, No. 12, Jalan Ngee Heng, 80000 Johor Bahru. Easter is the time of year that brings many people’s thought to bunnies, egg hunting, egg painting and whole loads of chocolate and sweets. 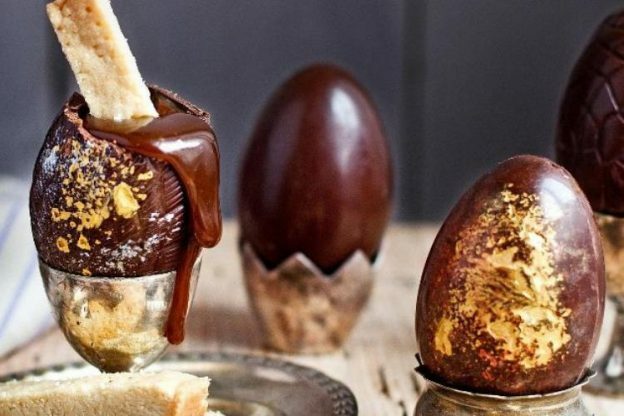 Get egg-citing at one of these most happening restaurants! Happening on 16th April, hippity-hop your way to Vasco’s with egg-citing Easter lunch buffet and partakes in activities for the little ones. Celebrate this Eater with egg chocolates to take home as gifts. Complimentary dining for one child below 10 years old with every paying adult at RM158 nett per person. For a more fun Easter Sunday celebration, you may pair up your buffet meal with Vasco's beverage packages as well! It’s going to be a fun-filled Sunday at Paya Serai Restaurant with its delicious Easter hi-tea buffet spread, special Easter chocolate buffet and exciting activities for the little ones. Make this Easter Sunday an awesome day for the kids by encouraging them to join in the egg hunting, face painting, magic show and more! This Easter hi-tea is priced at RM135 nett per adult and RM70 nett per child below 12 years old. Here comes the day for families and friends to gather together with laughter and feasting. This Easter Sunday, Cinnamon Coffee House will be serving a wide array of dishes that it takes a while to take in the options. Indulge in Easter favourites like Devilled Egg Mousse, Hot Cross Buns, Chocolate Eggs and selections of Easter Cakes and Cookies! This Easter hi-tea is priced at RM118 nett per adult and RM65 nett per child below 12 years old. Celebrate your Easter Sunday with Drift on Easter Day from 12pm to 4pm! On the menu we spot Freshly Shucked Fine de Claire Oysters White Wine Vinegarette, Spiced Gazpacho Crab Claw Shooters, Drift housemade Pancakes with Vanilla Butter Maple Syrup, Roasted Duck Apple Fennel Mint Salad, and more! RM250++ per person inclusive of food and free flow. 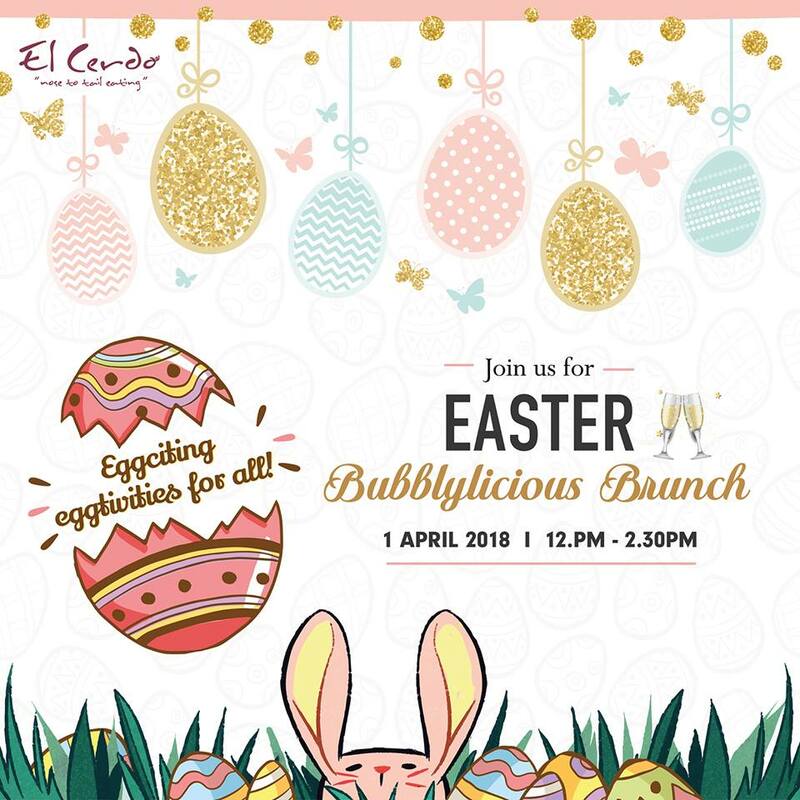 Make a reservation today for El Cerdo’s Easter Sunday Bubblylicious Brunch which will sure bring joy and laughter to you and the little ones! 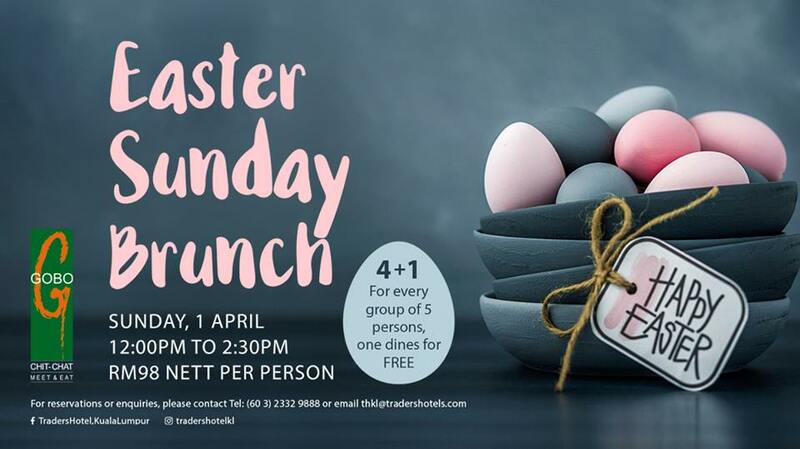 While having brunch, join in the exciting Easter activities including face painting, meeting the clown and also, there will be chocolate eggs for everyone! That’s not all! 2 lucky winners will hop away with a bubbly brunch for 2 worth RM392 nett! Don't miss this chance out!